Originally known as lightweight, the UFC's welterweight class is one of the oldest and most storied divisions in MMA's short history. Follow the path of the 170-pound championship belt. Perhaps best known for developing "Miletich Fighting Systems," Pat Miletich (right) was named the first 170-pound champion at UFC Brazil in 1998 with a controversial split-decision victory over Mikey Burnett. Miletich defended his belt four times, including a win over Andre Pederneiras, founder of the famed Nova União gym in Brazil. The first man to beat Miletich in the UFC, Carlos Newton (left) stunned the MMA world with a submission victory at UFC 31 on May 4, 2001 to become the second welterweight champion. At UFC 34, Matt Hughes was caught in a triangle choke as he held Carlos Newton against the cage. As he started to go out from the choke, Hughes slammed Newton to the mat, knocking Newton out cold and making Hughes the third champion in welterweight history. He defended his title five times, including a rematch with Newton and wins over Sean Sherk and Frank Trigg. B.J. Penn ended Hughes' run with a rear-naked choke at UFC 46 on January 31, 2004. His title run was short-lived, however, as Penn was stripped of the belt 107 days later after leaving for K-1. He would later win the UFC lightweight title upon his return and was inducted into the UFC Hall of Fame in 2015. Hughes became the first two-time champion in the division's history after defeating Georges St-Pierre for the vacant title at UFC 50 on Oct 22, 2004. He defended the belt twice more, including avenging his loss to Penn at UFC 63. Georges St-Pierre avenged the only loss of his career at that point when he ended Matt Hughes' title reign at UFC 65 on November 18, 2006. GSP was the first man to knock out Hughes in the UFC and became the second Canadian to hold a UFC title after Carlos Newton. Long Island's Matt Serra was granted a title shot after winning Season 4 of The Ultimate Fighter, and "The Terror" took full advantage. An 11-1 underdog, Serra took the belt from St-Pierre with a first-round knockout in one of the biggest upsets in MMA history. After winning two fights without the belt, including an interim title bout against Matt Hughes, St-Pierre avenged his loss to Serra at UFC 83 on April 19, 2008 and went on an historic run as welterweight champion. GSP defended the belt nine times, including once against interim champion Carlos Condit at UFC 154. At 2,064 days, St-Pierre's reign was the second-longest in UFC history. He voluntarily vacated the title in December 2013 to take a break from the sport. After losing a controversial decision in St-Pierre's last fight as champion, Johny Hendricks was able to secure the vacant title with a decision win over Robbie Lawler at UFC 171 on March 15, 2014. Former Strikeforce middleweight champion Robbie Lawler earned a rematch with Hendricks and capitalized, turning it on in the final round to win a split decision for his first UFC title. He then defended the belt in two of the greatest title matches in UFC history, stopping Rory MacDonald in the final round and winning a split decision over Carlos Condit. 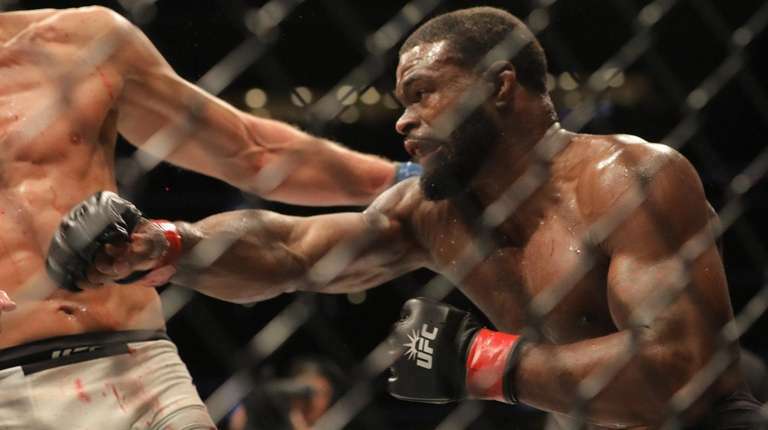 Former Division I All-American wrestler Tyron Woodley became just the second man to stop Robbie Lawler with strikes, knocking out the champion and winning the belt at just 2:12 of the first round on July 30, 2016 at UFC 201. He then fought Stephen "Wonderboy" Thompson to a majority draw in an epic fight at MSG at UFC 205, won the rematch via majority decision and then stuffed every takedown attempt by Demian Maia en route to a unanimous decision victory. At UFC 228, Woodley submitted Darren Till in the second round, holding him to seven total strikes the entire fight. At UFC 235 on March 2, Kamaru Usman dominated Tyron Woodley to win the title. Usman, a former NCAA Division II national champion, outgrappled Woodley, a Division I All-American wrestler at Missouri, the entire fight and never let him get going. Usman outlanded Woodley, 336-60, overall.